Last Saturday was my favorite kind of day: a two-show day in NYC. First, a stunning production of the Stephen Sondheim musical Follies. Followed by the fun, energetic, thoroughly entertaining How to Succeed in Business without Really Trying, complete with a post-show backstage tour (more on that later). It doesn't get much better than that! How to Succeed is the second Frank Loesser musical I've seen this year. The first was Guys and Dolls, and I can definitely see similarities in the songs, structure, and setting. 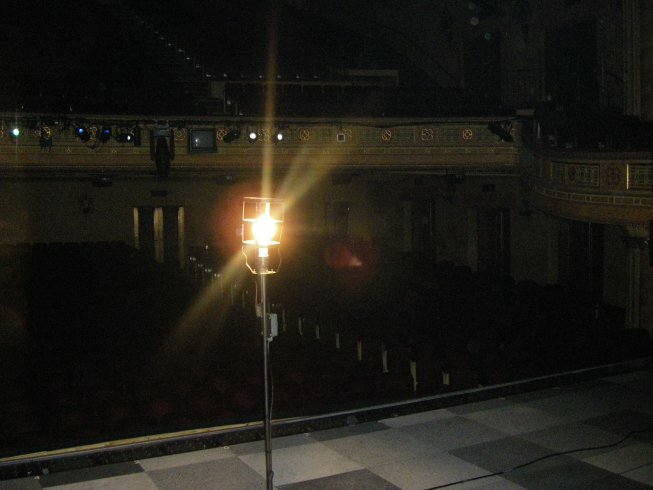 How to Succeed is set in a workplace in the 60s. Sort of like a dancing and singing Mad Men, without all the angst and serious consequences of the gender and racial inequities of the time. The costumes are fabulous, with the men in slim-cut suits with skinny ties, and the women in mod sheath dresses with matching hats and bags. The character of Rosemary alone has at least a half dozen of these dresses, all in various shades of pink! The backdrop of the set is a sort of honeycomb, with changing colors in the cells, which also house dancers for some numbers. The set is comprised of an intricate series of moving pieces that represent different areas of the office. I was particularly impressed by an overhanging ledge that popped out of the side and supported a desk and many people. The plot of the show follows a young man named J. Pierrepont Finch who manages to climb the corporate ladder in a short time by manipulating situations and impressing the right people; he's like Eddie Haskell of the business world. The young man is of course played by Daniel Radcliffe (you may have heard of him from his role in a little movie franchise). He gives an amazing performance and really leads the show. The fact that at the height of his career, when he could have done anything he wanted to, he chose to do musical theater on Broadway, is a pretty cool thing in my book. And he doesn't just rest on his laurels as a "big star;" he's worked really hard to learn the singing and dancing this role requires, and it shows. This is not easy choreography; it's intense and driving and relentless. In one number he's being carried and twisted and turned through the air, in another he's stamping letters and effortlessly tossing boxes around the mail room (one of which ended up in the audience, and whoever caught it was not giving it back! ), not to mention leading the ensemble in the showstopper, "Brotherhood of Man." I was more impressed than I expected to be by a "movie star," and I'm looking forward to watching his career grown on stage and screen. The rest of the cast is just as amazing as its lead, from the secondary characters to the last member of the ensemble. John Laroquette (who won the Tony for this role) plays the president of the company, and his comedic skills are used quite well. I wonder how many of his funny little ticks and gestures have been added as he continues to perform the role. He and Dan have great chemistry as boss and favorite employee. Rose Hemingway plays Finch's love interest Rosemary (she of the multiple pink dresses) with a sweet earnestness that makes you believe she really would be "Happy to Keep his Dinner Warm." Christopher J. Hanke plays the boss' nephew and Finch's nemesis, and really hams it up (in a good way). Last but not least, one of my favorite soap actors Michael Park (Emmy-winner for his role as Jack on the dear departed As the World Turns, who's also a veteran of the stage) brings his charisma and talent to the role of sycophantic personnel manager Mr. Bratt. From his previous soundtracks (Smokey Joe's Cafe, Violet) I knew he could sing, but he's a pretty smooth dancer too. 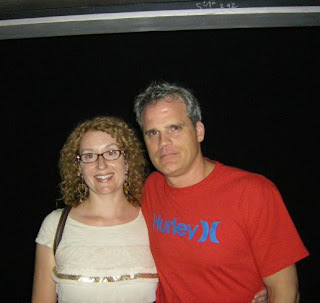 I have a mutual friend with Michael, who arranged for my theater buddy and me to meet up with him after the show, which led to my amazing backstage experience. 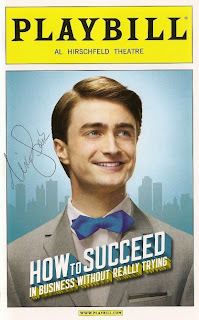 ﻿Unlike the other shows I've posted this week, this playbill only has one autograph on it. That's because this show has the craziest stage door I've ever seen. If you go see a Broadway show and want to say hello to the cast, it's pretty easy to find the stage door, wait ten minutes, and get autographs from the entire cast as they leave the theater. But not this show. There were cops, barricades, and more people than I've ever seen at a stage door. They were all there to see Daniel (and maybe John), which is unfortunate because the fabulous ensemble members snuck out and away without anyone really noticing. Fortunately, we were on the guest list so we were escorted past the waiting crowds right up to the door, where Michael greeted us and led us inside. We walked a few feet, and suddenly we were on the stage! ﻿Ironically, the stage at the Al Hirshfield Theatre is the one Broadway stage I've previously been on, when I saw HAIR there twice last year and danced with the hippies on stage after the show. But this was different. The theater and stage were completely empty, except for us and a few cleaning people. Michael showed us some of the parts of the set and what moves where. He very kindly talked to us for quite a while. He only had great things to say about Daniel, both as a person and a performer. Dan walked across the stage while we were standing there talking, and we exchanged nods. He went outside accompanied by screams, and when we left the crowd had mostly dissipated. We walked home on a high from our fabulous day of theater in NYC, capped by a once in a lifetime backstage experience. Thanks Michael! How to Succeed is definitely a great choice if you're in NYC and want a fun, entertaining, classic musical theater experience. Daniel leaves the show on January 1, to be replaced by one of my favorite Glee kids Darren Criss. He'll play the role for three weeks, followed by a Jonas brother (no comment). If I were you, I'd make every effort to see the show this year, or in January. But with this huge and talented cast, the incredible choreography, and great music, it's sure to be a fun time for the rest of its run on Broadway. Wow, it sounds like you had a great trip to New York! You should come for the Broadway Cares Flea Market sometime - it's great. I was there last weekend and really enjoyed it. 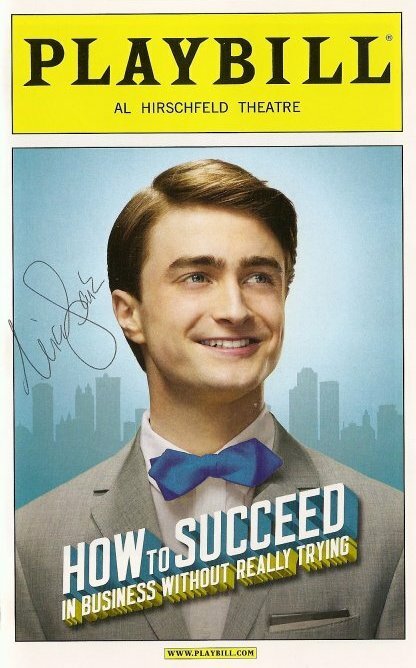 I also loved How to Succeed. I was grinning from beginning to end. I thought the choreography was imaginative and exciting to watch. And the crowd was so pumped up to see Daniel Radcliffe. It just gave the show an incredible amount of energy. And I'm so envious of your backstage experience! inspiring too are his comedic chops, as plain whenever he, spotlit, share with the viewers his significant, impetuous smile to signal that his latest scheme has pull from end to end.